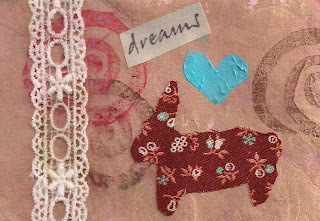 I belong to a group on Etsy called the ACEO Group (for definition of ACEO, see earlier article). Every month there is a challenge put out by a member, sometimes there are several challenges issued. There is no deadline on when a person can submit an image, so, for example, someone may submit in October a challenge that was given in August. One recent challenge tugged at my heartstrings. It was "Favorite Toy." When I was a little girl I had a small bunny. It was just flat, stuffed a bit, but not three-dimensional the way bunnies are today. And I adored it. I carried it with me everywhere. I have a vivid memory of my mother bringing my bunny to me in the hospital, and how, once I had it, I felt safer, and better too. 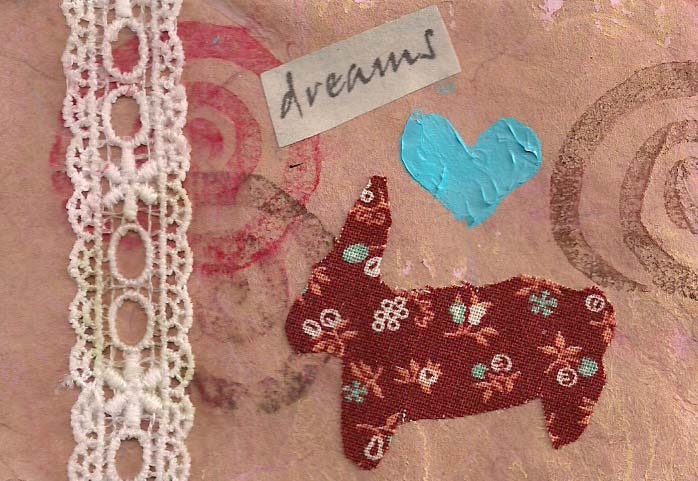 This ACEO is an homage to my bunny. It is a collage made up of rice paper, fabric, stampings and newspaper. I hope you like my humble little bunny. wonderful texture & color in this ACEO! Such a cute theme too.